Rory McIlroy hailed the influence of "fantastic" captain Paul McGinley after Europe surged to a commanding Ryder Cup victory at Gleneagles. 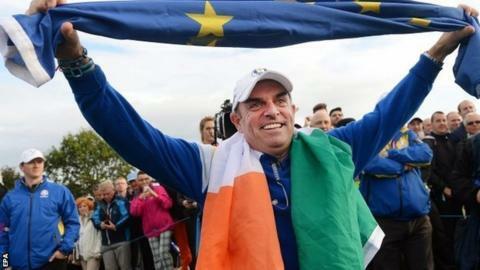 The world number one said the Irishman's meticulous attention to detail had helped set up Europe's eighth win in 10 Ryder Cups. "He has just been the most wonderful captain," said McIlroy. "I think I speak on behalf of all the 12 players and say he couldn't have done anything else. He was fantastic." McGinley, 47, had drawn on the experience of former Manchester United manager Sir Alex Ferguson, who addressed the team prior to the start of the tournament. McIlroy added: "From the first day we got here, the speeches that he gave, the videos he showed us, the people that he got in to talk to us, the imagery in the team room, it all tied in together. "It was all part of the plan, all for the cause of trying to win this Ryder Cup, and he was meticulous in his planning. He left no stone unturned." McGinley's side led 10-6 going into the final day and Europe needed four points to retain the trophy they claimed two years ago, but they won five matches and halved three more to seal a comfortable victory. Lee Westwood, 41, playing in his ninth Ryder Cup this week, said McGinley has laid down the blueprint for future European Ryder Cup captains, while Spaniard Sergio Garcia, now a seven-time veteran, suggested McGinley had modernised the role. "I think you could base your captaincy and your future captain around the way Paul did it this week," said Westwood. And Garcia added: "He has been so methodical. Every single aspect he needed to touch on, he did. I've been fortunate to have a lot of great captains. Paul did things a little bit differently, but with great style. "He has been a little bit more of a modern captain, taking care of every single detail. He knew what we had was good but improved it without changing it." McGinley, who sank the winning putt as a player at the Belfry in 2002, insists he has no plans to try to do the job again or act as someone else's vice-captain. "I've got a role now in deciding who the next captain will be, and we'll see where that goes in the next few months on behalf of the European Tour," he said. "But certainly, no, I've done my piece and I'm happy to have the honour and happy to help in any way going forward but I don't think it would be right for me to go into the vice-captaincy role."